3/21/08: A friend of mine let me borrow his PAR meter. It is battery-operated, and calibrated at the factory. I fabricated an acrylic handle to keep the sensor level at a fixed height within the tank as I tested various locations. The handle allowed me to get these readings without creating shadows. The sensor had a small screw in its base which I used to secure it to the acrylic handle. 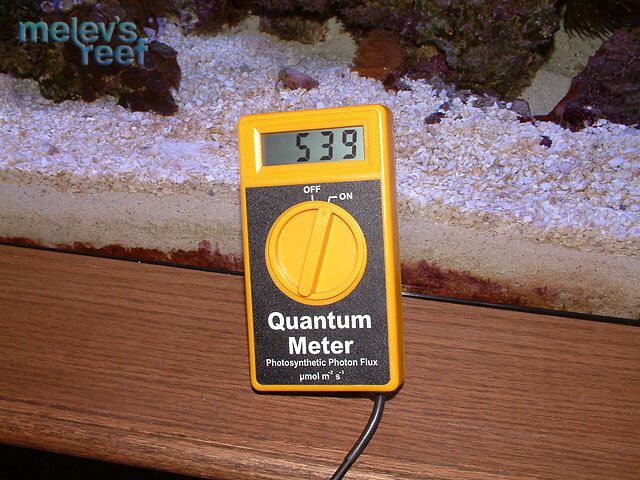 The meter's numbers would dance around quickly as the surface of the water constantly changed the way the light hit the sensor with all of the pumps on. Each location was observed for about 20 seconds and the best average number was recorded. Using blue tape, I marked the distance on the handle to keep the sensor at the same height as it was moved horizontally through the tank. The first set of readings were taken with the lights just as they are - slightly spotted with salt spray, the reflectors less than clean. It is interesting to see just how weak the right side of the tank reads. That bulb is powered by an unknown magnetic ballast received in trade, years ago. 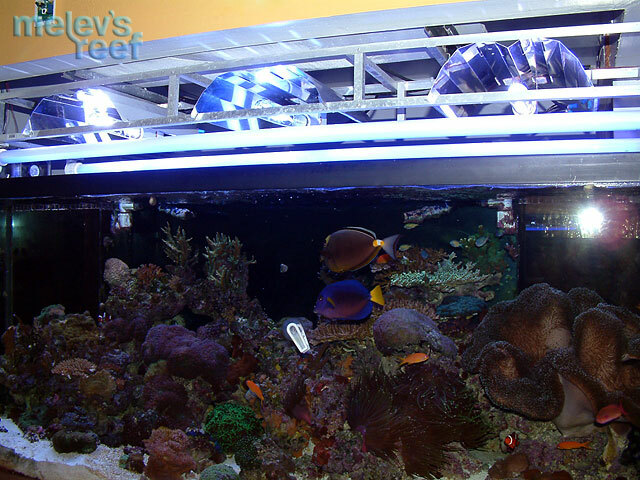 The PAR is half that of its counter part on the left side of the tank, which uses an IceCap Electronic Ballast. 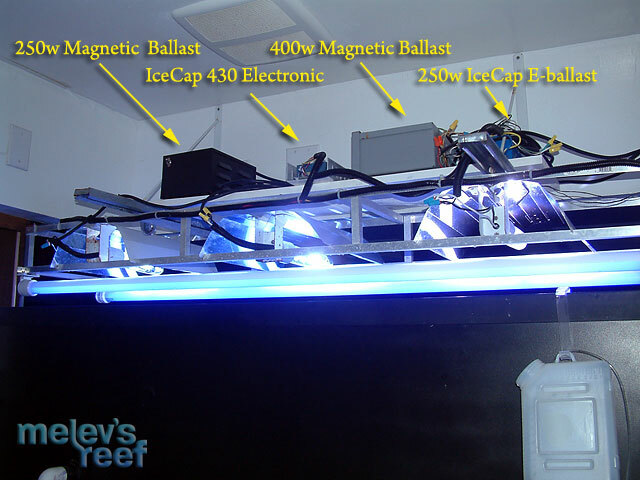 Both ballasts are 250w ballasts, and both use the same ReefLux bulbs. The age of the bulbs is unknown, because as they break they are replaced and I don't have a handy log with those facts unfortunately. I do post when such things occur, but wading through my Reef Log or my 280g diary thread is more work than I'm willing to do. Sorry guys. The water in the tank is quite clear - a water change was performed 6 days ago, and active carbon filtration is ~10 days old. Considering the fact that these reflectors are nearly 4 years old, they clean up pretty nicely. All three bulbs were replaced with brand new bulbs. 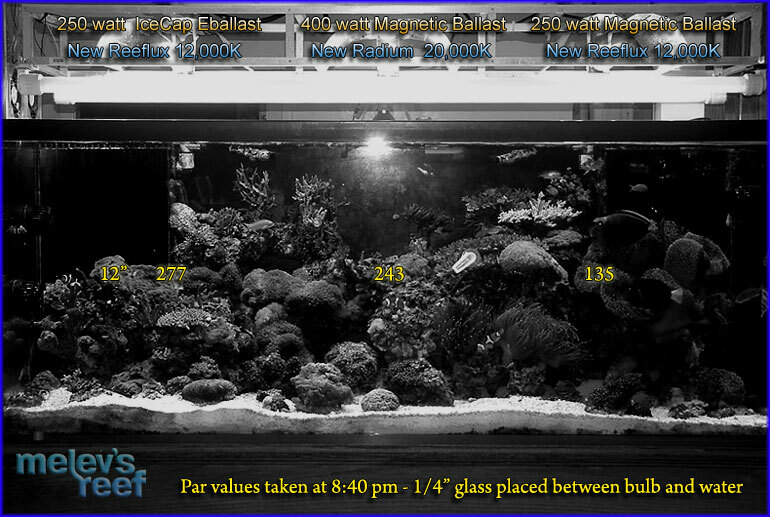 Two 250w ReefLux 10,000K bulbs and a Radium 20,000K bulb. 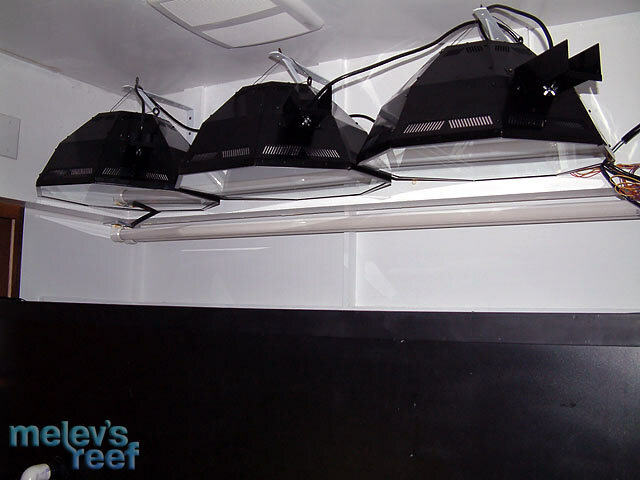 The lighting rack was reassembled with the clean reflectors. Here are the ballasts I'm using for my lighting. Remember you are looking at it from the reverse side, if you are comparing ballasts to PAR readings. Each picture is labeled with the type of ballast over the column of numbers beneath it. 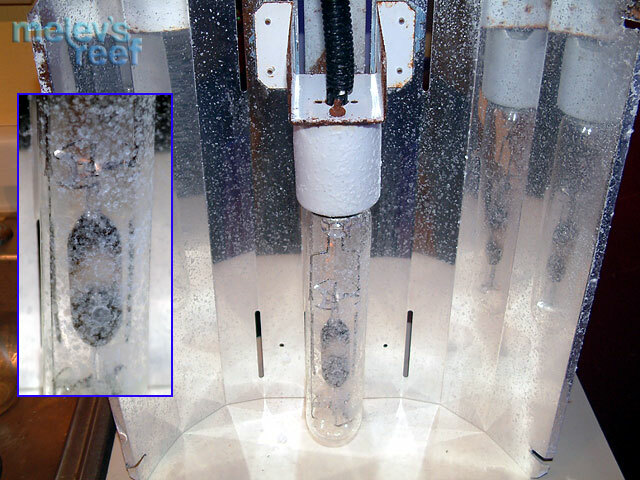 The VHO ballast (IceCap 430) was not included specifically in the PAR meassurements, but was providing actinic lighting to the tank during each test. Measurements were taken once again with the clean reflectors and brand new bulbs. The bulbs burned for about 30 minutes before the PAR readings were taken. You will notice the numbers rose compared to the old bubls, which is to be expected. I do not know if the PAR values would change after the initial 100 hour burn in period. These are brand new, out of the box. 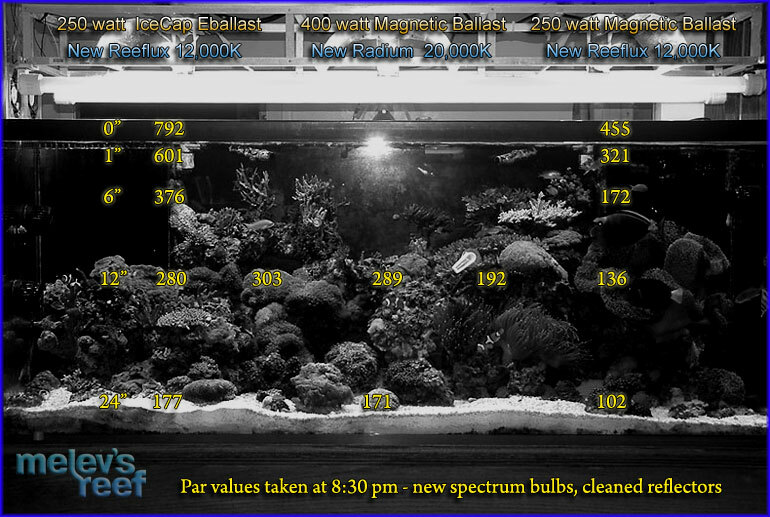 I next took out the 250w 10,000K bulbs and replaced them with brand new ReefLux 250w 12,000K bulbs, and took new readings. As expected, the PAR declined slightly. 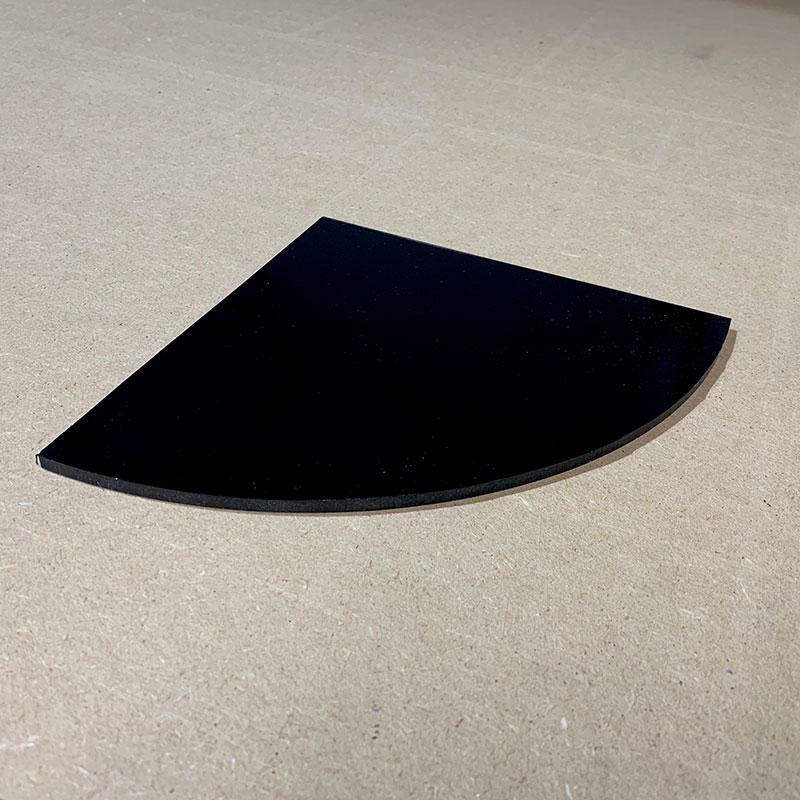 While I was at the glass shop on Friday, I brought home a piece of 1/4" glass that is 20" x 20". 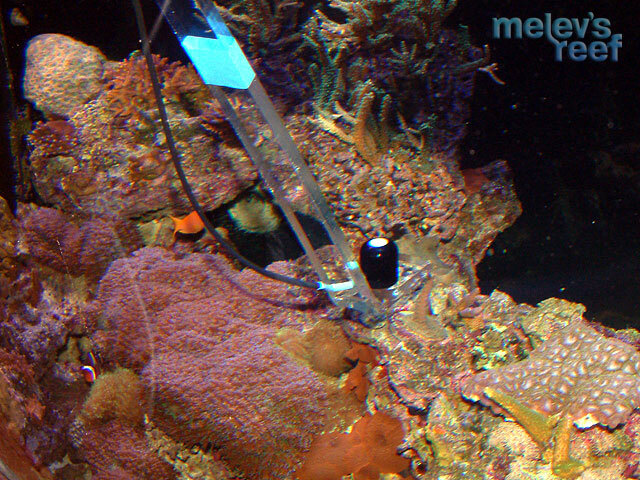 This was placed on top of some acrylic strips spanning the tank, putting the glass squarely beneath each bulb. PAR readings were taken to see how much light the glass filtered out. Because the glass was essentially in my way, I used the acrylic holder to hold the probe 12" directly beneath the bulb, and took only one reading. There was very little drop off in PAR. I repeated the test, this time using a 1/4" thick piece of clear acrylic (AcryLite FF). Again, not having room to move the sensor, measurements were taken at 12" and recorded. 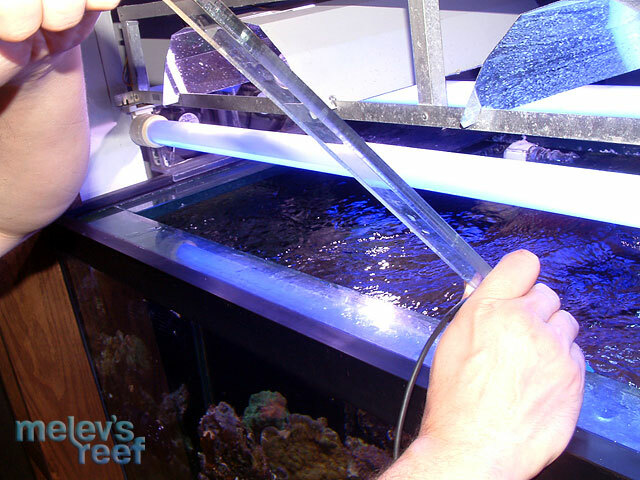 PAR values change dramatically due to the flow in the tank. As ripples occurred, the numbers changed rapidly making it hard to get a specific number. Holding the probe 6" beneath the water 4" from the front glass of the tank under one 12,000K bulb (IceCap E-ballast), the PAR dropped to 334 and rose as high as 456 during a 30 second period. Measuring again under the other 12,000K bulb (Unknown Magnetic ballast), the numbers varied from 116 - 154 in the same time span. One thing that is very apparent is that the unknown magnetic MH ballast is in need of replacement. However, looking at how beautifully the right side of my tank is doing, I'm unsure if I want to increase the PAR and risk cooking the huge Toadstool Leather. In an effort to acclimate my tank to the new Lumenbright reflectors, I'm probably going to install the used MH bulbs and later replace them with new bulbs. 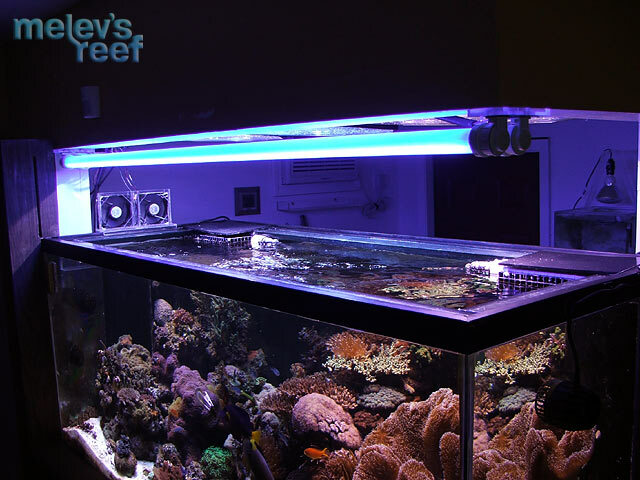 This should prevent the corals from being shocked by the huge increase in light. I contacted a local glass shop to order 20" x 20" pieces of tempered Starfire glass to keep the bulbs and reflectors clean of any saltwater spatter. The plan is to install the glass about 1" below the reflector to allow heat to exit and still protect the light fixtures. I do expect a slight drop off in PAR, but not anything major based on what I saw today. The glass will cost about $55 per piece, and should be here by the end of the week. I will probably replace the unknown magnetic MH ballast with another IceCap 250w e-ballast and take some measurements during Phase Three. 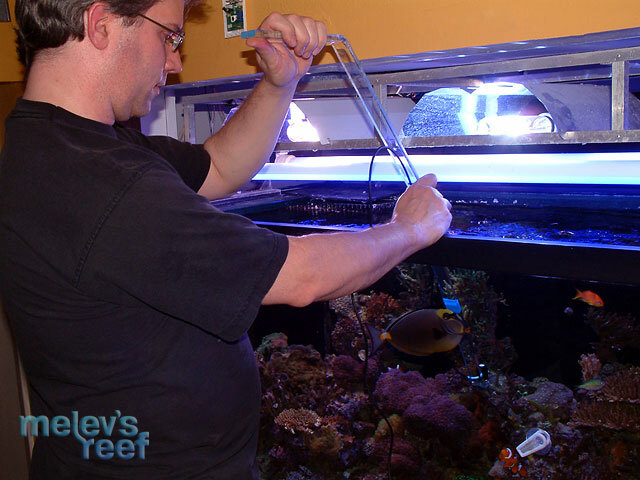 3/24/08: The lighting rack was taken down, and new Lumenbright reflectors were temporarily placed over the tank. Once they are secured, PAR readings will be taken. 3/25/08: The new Lumenbright reflectors were sold to a DFWMAS member. I ordered different ones (pictured below) that had the glass already included, which arrived a few days later. 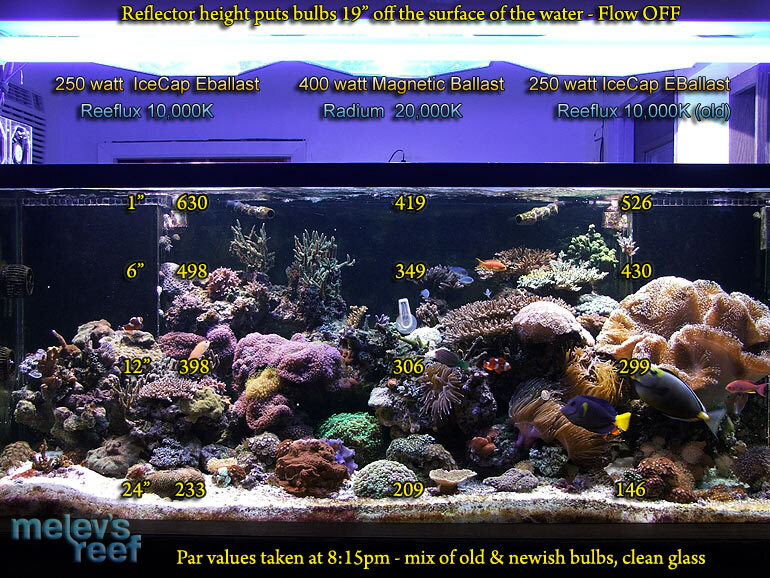 They will be mounted with the bulb 18" off the water, at a slight angle to shine down into the reef. 3/31/08: The replacement reflectors I ordered from ReefSpecialty.com arrived quickly, and it didn't take me long to install them. Each reflector has a painted outer shell that allows heat to exit via vents and also holds a piece of tempered glass to keep the inside reflector & mogul clean. 5/08/08: PAR tests were performed. 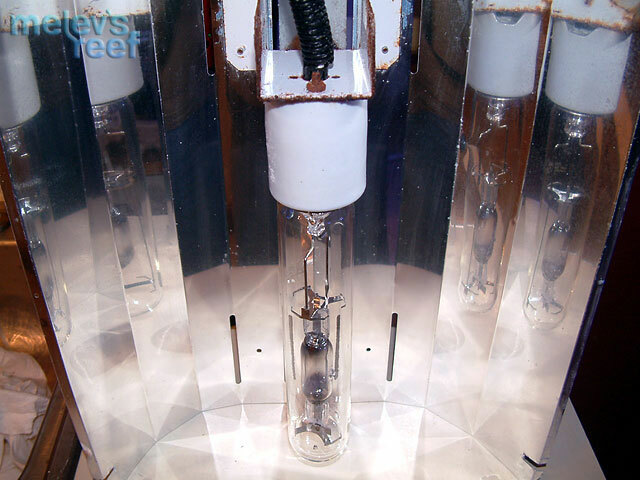 The 400w Radium bulb is probably 3 months old. 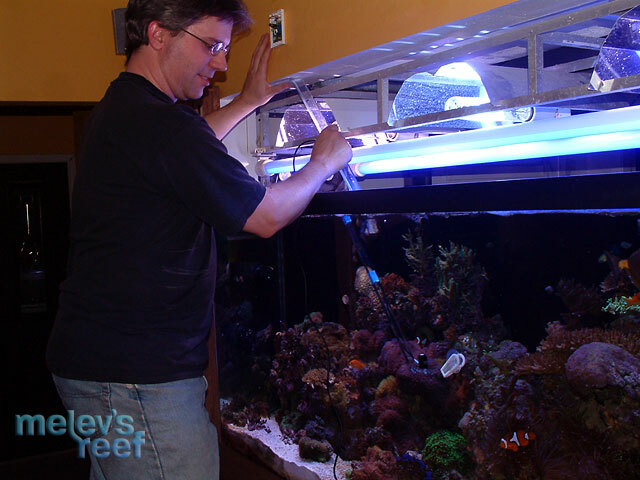 The 240w Reeflux bulb on the right side of the tank is quite old and very yellow (probably 8 months used). I purposely did not change it until I could perform these tests to compare the differences in PAR between a new Reeflux and a used one. The distance of the bulb to the surface of the water is 18". The glass shields on the reflectors was relatively clean with a few bits of spatter, but not enough to alter the results of this test. The pumps were running, and each time a spot was measured for about 20 seconds to find the average reading (between the highs and the lows that quickly flicked across the display). The next test was change out that ugly yellow bulb on the right side of my tank. The new bulb was lit for 30 minutes prior to testing. The difference in PAR was substantial. Also, note the numbers (rows 2 and 4) between the reflectors. I thought it was interesting how up high, the numbers were lower than what was measured 6" beneath the surface. The reason for this change must be caused by the light intersecting at that point as the light shines from both reflectors into one spot. Specifically, I'm referring to "482" and "472" - compared to the "442" and "440" that were measured above those points. Once this was done, I took out the 10,000K bulbs and replaced them with 12,000K Reeflux bulbs and measured again. These are brand new bulbs, burned about one hour prior to this test. I know that some people also like to measure the PAR in a tank devoid of flow. 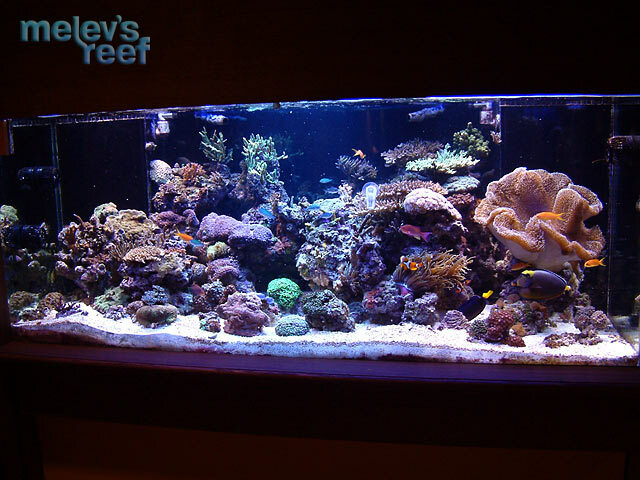 To do that, I turned off the return pump as well as the VorTech pumps in my reef. By doing so, the distance between the water's surface and the bulb was increased to 19" since my tank drains 1" when the return pump is off. Please keep in mind that the numbers are slightly different, not easily compared to the prior tests. The surface is 1" further away from the bulb, and the rest of the numbers were the result of having to penetrate 1" less water than standard conditions. First the test with the "as is" bulbs. Next, the right 250w bulb was replaced with a new one. And then the 10,000K bulbs were removed and replaced with 12,000K bulbs. After all this testing, one has to ask what the final conclusion is. Let's just compared two slides. The very first one from this page that had my old light rack and spider reflectors, and then the more recent slide showing the lighting I'm using now. 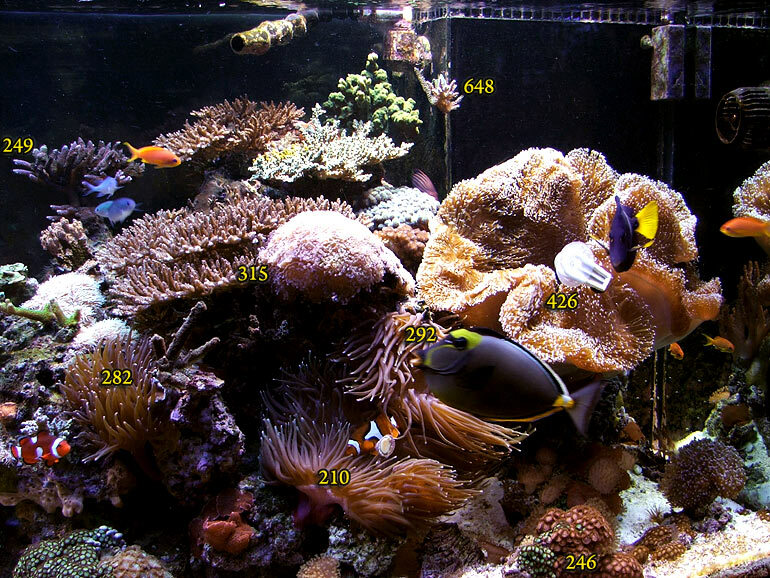 As you scroll back and forth looking at various points in the tank, you'll see overall there is an increase of light. Some may think that the numbers are somewhat misleading because I didn't use the same magnetic ballast on the right side of the tank, which is true. When I upgraded to the newer reflectors, I had to tidy up the fishroom and in the process I made that change. Be that as it may, the old lights were 9" off the water and the new bulbs are 18" off the water now. 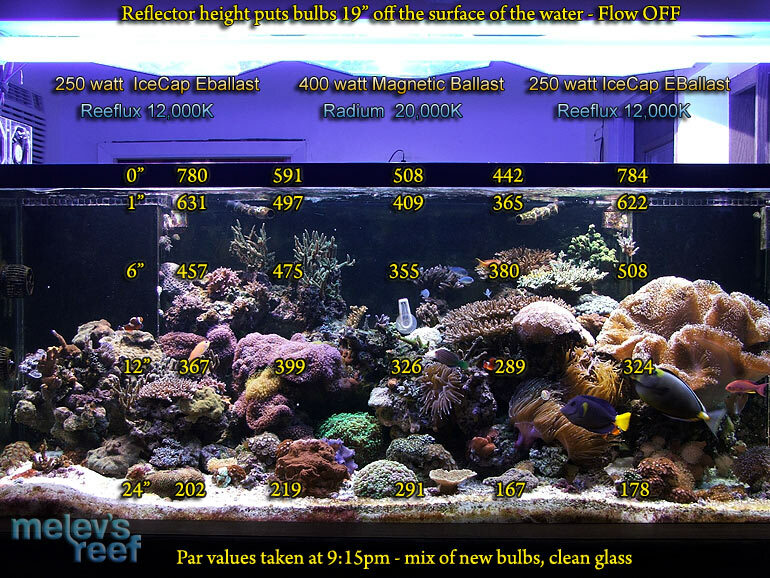 Far less heat is pouring into the tank during the photo period each day, which is a huge benefit to my reef. Additionally, my livestock has shown marked improved growth since changing to these reflectors, which are only lit six hours per day instead of my previous nine hour photo period. I touched on this briefly before, but I'm going to reiterate this point: Due to the increased intensity created by these reflectors, it is critically important that you reduce the time the bulbs are lit -- especially on an established reef. When I installed these, I was warned to not run them more than 4 hours per day for a solid week. That seemed so short, so I staggered the lighting so I could enjoy my tank longer each day. The first bulb was on from 12-4pm, the second one from 2-6pm, and the third from 4pm to 8pm. The actinics ran from 12-9pm. This way no corals were overwhelmed with the increased PAR, and yet those same corals would get a little light from the neighboring light that was still on. 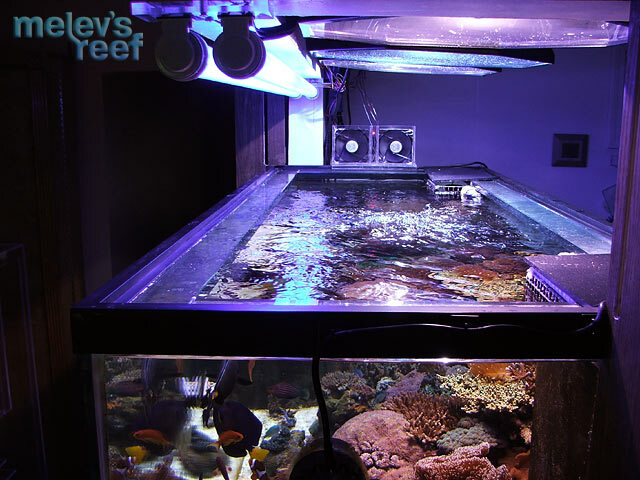 No corals were burned nor bleached by the light, and everything adjusted beautifully to the new set up. It was a little bit annoying to see part of my reef dark during the day time. 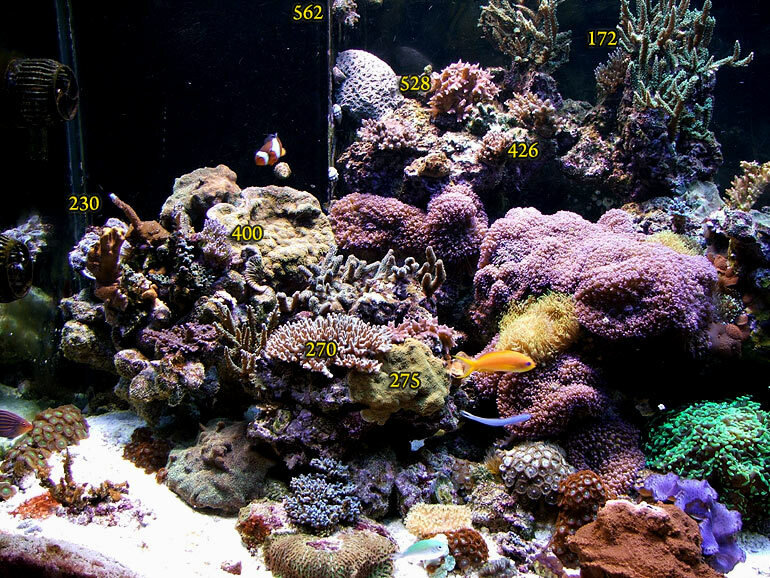 10,000K ReefLux (right) 1:00 p.m. to 7:00 p.m.
20,000K Radium (center) 2:15 p.m. to 8:15 p.m.
10,000K ReefLux (left) 3:30 p.m. to 9:30 p.m.
VHO lighting 11:00 a.m. to 10:00 p.m. I really like all the space I have above my tank to work with no risk of being burned. Even moreso, I like the way my tank looks evenly lit with no shadows. What I did was take a few measurements next to specific corals to get an idea of what kind of light they each received. 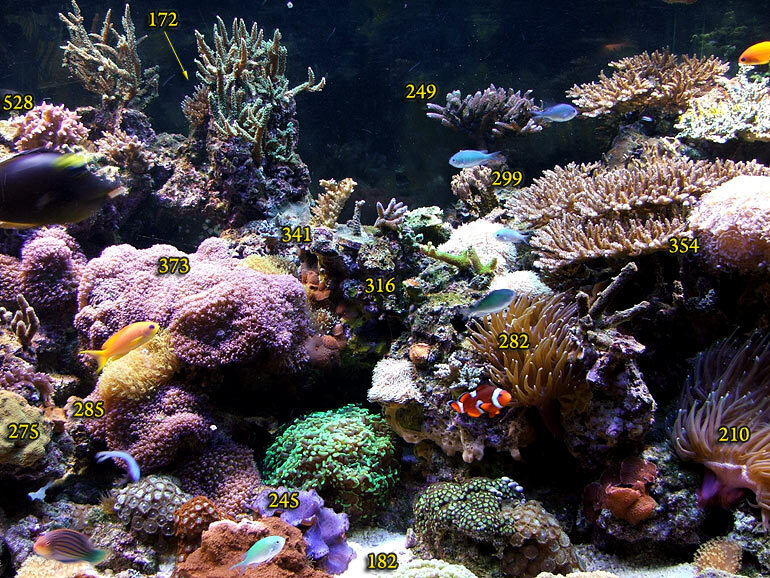 As you look at the following pictures, the number nearest each coral is what it read on average. Beneath each image, I'll detail the item specifically. While my son felt that all this testing was crazy since this is only a hobby, I found it very very interesting. This takes a lot of the guesswork out of what we are trying to accomplsh, and I hope you too will find it useful.